You can easily achieve the same effect in APub (and the other Affinity apps) by dragging a shape to the masking/cropping position for the image layer and applying a Gaussian Blur layer effect to soften the edges. You can feather the edges using the transparency tool, depending on the shape.. 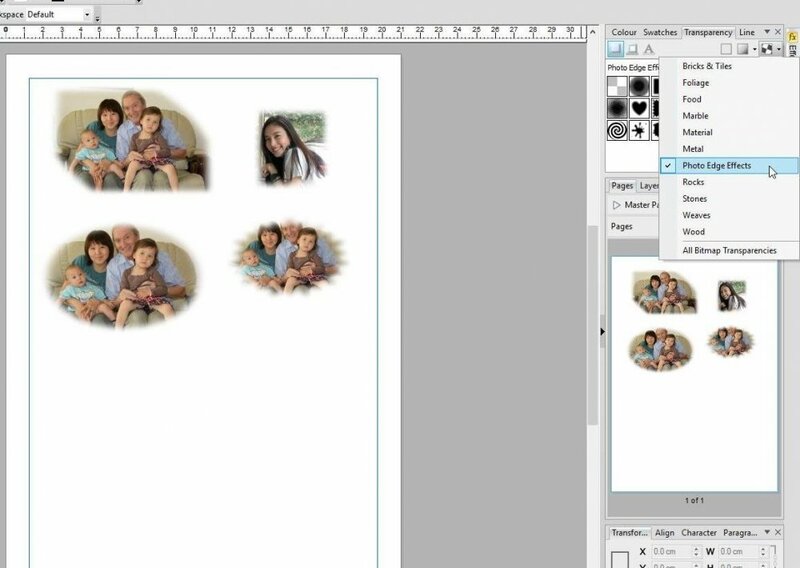 I'm not really seeing a way to blur just the edges using Publisher, but if you also have Photo, you can prepare such a shape using Photo, copy/paste it into Publisher, then save it into the Assets panel as an asset that can be reused. 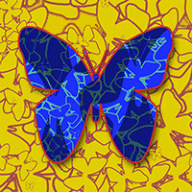 Create the desired shape using a shape tool or any other means of creating a vector shape within Photo. Duplicate the layer; leave it precisely over top of the original layer. Give one of the layers a fill but no stroke. Set the stroke of the stroked object to an elliptical gradient; reduce the opacity of the point that shows up on the right in the popup to around 50% or perhaps just over. 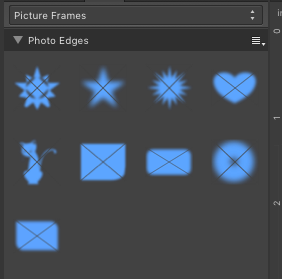 With the filled object selected, add a Gaussian Blur live filter using the popup menu on the Layers panel (this is the one step you can't do in Publisher or Designer - only Photo can create these, though they do get copied to the other programs along with the final object). Set the radius to around 9 or so. This should leave you with the filled-shape layer containing the blur filter containing as a mask the stroked shape layer. You might need to experiment after that with the thickness of the stroke, the blur radius, and so on, but you can make those adjustments within Publisher once the filter has been created. You can also do these after the first one from within Publisher, without having to switch to Photo, by copying the blur layer from another shape you already created. ok, took me another look to catch on... @Alfred and @Michail are blurring the mask rather than the image, and you can certainly do that in Publisher, as indicated. 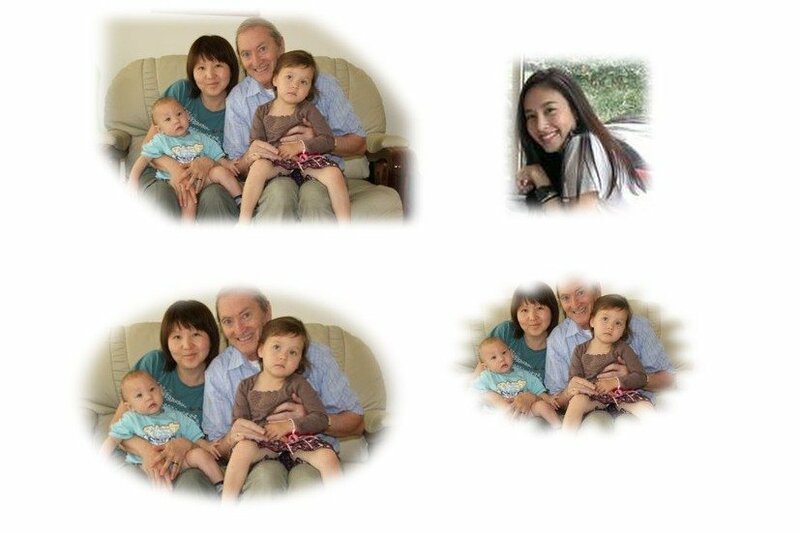 This will give a fuzzy shape to the edges but the picture itself will remain sharp and crisp. If you want to blur the actual image, you will need to use the live filter instead, and only Photo can add those. Looking more closely, the OP's examples do seem to be blurred masks, so this technique is probably more relevant than what I described. If you are only trying to blur the mask it is actually simpler than I outlined above. Just create the shape to use as the mask and drag its layer to the right of the thumbnail of the image layer in the layers palette to make it a mask of the image (you should see a vertical line highlight up against the image showing that it will become a mask). Then select the mask layer in the palette and click the "fx" button under the list of layers; enable Gaussian Blur and adjust the radius. I find this a bit fiddly to position the mask correctly in the layers panel. 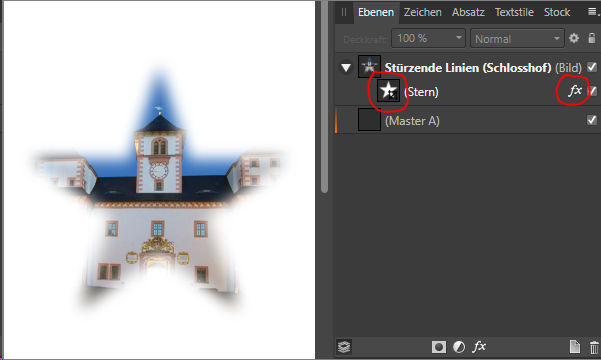 I prefer to select the photo, then create the shape with whatever tools you want, then right click the object in the Layers panel and Mask to Below. I'm using this feathering process a lot these days and it really is useful. You do need to make sure the mask shape is displayed as a child of the photo layer to ensure only the photo gets feathered. 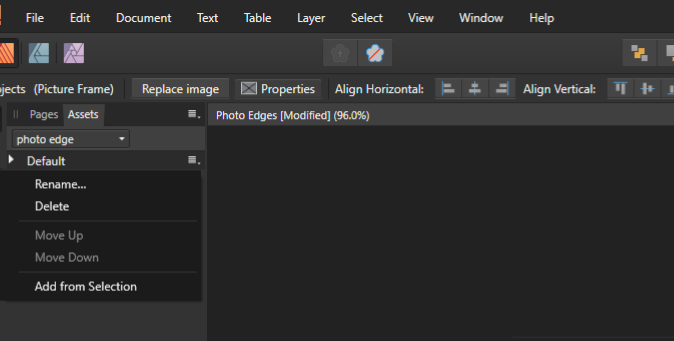 Drop the shape layer on top on the image layer’s thumbnail, not to the right of it. That’s exactly what I did, and what I meant by “dragging a shape to the masking/cropping position for the image layer and applying a Gaussian Blur layer effect [to the shape layer] to soften the edges”. Good catch - the mouse pointer can actually be over the thumbnail, but the highlight shows up to the right of the thumbnail. I gather that now, but in the original post you left out the "to the shape layer" part and the assumption seemed to be that it was applied to the image layer, which gave the undesired effect. I was clarifying it for the OP. That’s a fair point. When I wrote those words it was obvious to me that the layer effect should be applied to the dragged/dropped shape, but I can see from the subsequent discussion that it wasn’t as clear and unambiguous as I thought! As a starting point for anyone still struggling with this, here is a small set of starter "photo edges". I am by no means an expert on making these so I'm sure you can tweak them to make them better, and I only did a few as a set of starter examples. To use these in a document, just drag one from the assets panel into your document, place a picture in the frame, and resize and manipulate to taste. on windows you can't drag in to the assets panel, but have to add from selection. How did you create the shapes? Mostly just using the shape tools that are available in Publisher. For some of them I used the "Add" or "Intersect" buttons (I have them on my toolbar) to combine multiple shapes.